Yipee! I just came from my friend’s housewarming party, and now I’m back to reviewing comdolls! It looks like these weekly reviews are helping me with my trading since I’ve made back-to-back wins lately. Besides, as our resident trading psychology guru pointed out, deliberate practice can make you more alert for potentially profitable setups. Even though it takes extra time and effort to review past price action, the pip-rewards are definitely worth it! What moved the comdolls this week? The Aussie and the Kiwi took hits from the Greenback for most of the week as worse-than-expected economic reports were printed in Australia and New Zealand. Meanwhile, the oil-related Loonie was an early favorite since oil prices went back to trading above the $100 per barrel mark when concerns in the Middle East failed to ease. Around the middle of the week we saw the RBNZ cut its interest rates not just by 0.25%, but by 0.50%! This shocked markets so much that NZD/USD fell to a 5-month low. Heck, even I joined the bears’ party! 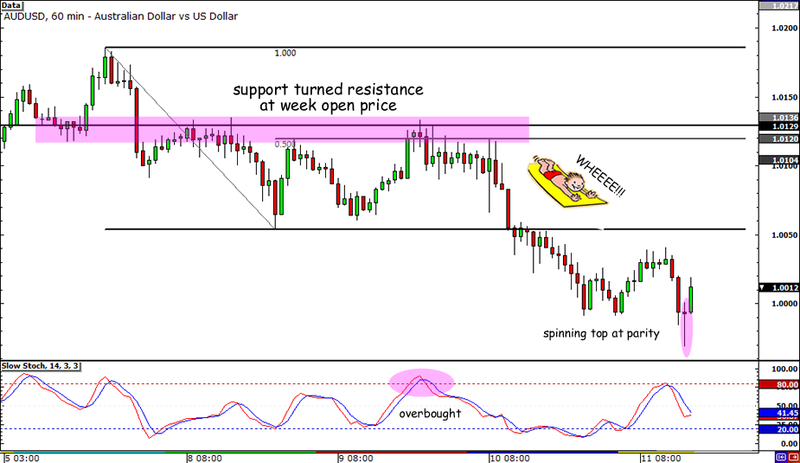 Have you seen my NZD/USD trade this week? Even though price initially missed my entry, I shorted at another level when I saw another opportunity to sell. Anyway, commodity currencies lost more ground against the Greenback for the rest of the week as risk aversion reigned in markets. Employment figures in Australia unexpectedly fell by 10,100 when my geeky forex friends thought it was going to rise by at least 20,000. In fact, the Land Down Under has been printing weak figures lately, forcing AUD/USD to break below the ascending triangle on the daily chart. Support at the 1.0129 week open price held at the start of the week, but weak home loans data from Australia forced it to switch gears and act as resistance. The pair pulled up from its dive mid-week and retraced until the 50% Fibonacci level, which was in line with the week open resistance. From then, risk aversion surged as Australia churned out weak labor data, China announced a trade deficit, and Moody’s downgraded Spain’s debt. When it rains, it pours, doesn’t it? Because of that, AUD/USD took a 130-pip dive all the way from the week open price to the 1.0000 handle. Price stalled above the 1.0100 major psychological level for a while but broke down later on. That could’ve been a chance to add to my position had I taken that trade. Another opportunity to add was at the break of the 1.0050 minor psychological support. Had I spotted this setup and taken it, I probably would’ve used a 40-pip trailing stop. I would’ve zoomed in to the shorter-term time frames to wait for break-and-retest opportunities and added at 1.0100 and 1.0050. In total, this could’ve resulted in a 280-pip win (130 pips from my first position, 100 pips from the second, and 50 pips from the last position) if I aimed for parity. That’s a sweet 7:1 reward-to-risk ratio! Without adding positions, the trade would’ve still resulted in a 3.25% win if I risked 1% of my account with a 40-pip stop. Dang! How could I have missed that?! Don’t get me wrong, I’m not feeling bitter about this missed trade. In fact, I’m enjoying the learning opportunity, knowing that this improves my confidence in taking similar setups later on. Once I spot another nice setup like this, I’ll be posting an update on Twitter right away so make sure you’re on my guest list… Oops, I meant followers list!